Campingpark Lemgo är en camping i Lemgo, Nordrhein-Westfalen, belägen vid en flod/ en bäck. Campingen har platser med skugga, utan skugga och platser med lite skugga. På campingen finns en lekplats. För den sportige semestervandraren har campingen olika cykelleder. Vem vill inte efter en hård dag slappna av i en sauna, ett solarium, en jacuzzi och ett ångbad. Campingen förfogar över en utomhusbassäng, ett uppvärmt inomhusbad och ett knattebad. Det finns också en vattenrutschbana. Denna inspektör gör varje år ett besök på Campingpark Lemgo och inspekterar campingen för ca 200 faciliteter och för andra förekommande punkter. Inspektören är en medarbetare från ACSI och arbetar inte för campingen. Good location for visiting town of Lemgo on foot. Really friendly reception staff, very helpful. Even though this site is on the edge of the town it is extremely quiet day and night. Toilets and showers always clean and was able to use shower block in adjoining sister site if necessary. Fiddly shower procedure using a keycard supplied at reception could lead to it switching off if the card gets wet, which it will....... No set pitch places but plenty of options for siting van and not crowded. (Early May visit). All on grass with plenty of shade. Easy access for water, drainage and refuse. Loads of lovely cycling paths direct from the site. Would definitely recommend. Since the start of 2014, while travelling in Europe, we have relied 100% on the ACSI directory and the website. The choice of sites for our special visit to Detmold where I lived as a child in the early 60's was very limited which resulted in our choice of this site. The ACSI book states that the sites in Germany are the best in Europe. So this site did not meet our expectations. It may have been a result of the lack of English from the lady on reception, or my own lack of German, but the lady was not very welcoming, and a little scary! But she did walk us to our pitch, and showed us where everything was. We were given a couple of pages of information in English on things to see in the area which was very helpful. Although there was a barrier to the site, this was always open, and access to the site was easily available from the public footpath at the rear of the site. So it was not a secure site in my opinion. The grass pitches were not marked out, and the grass was overdue for cutting. The toilet & shower facilities were excellent. Two showers and a couple of cubicles in the men's, which were always clean, and I never had to wait. We were provided with a special plastic card which you needed for hot water in the shower, which was a clever arrangement. The site is located on the edge of Lemgo, and easy to find, and you can easily walk into town, although compared to Detmold, there is not a lot to do in the town. As I said at the beginning, there are not a lot of sites in the area, and in would not make a detour to go here again. Really good well kept site right on the edge of Lemgo town. Easy walking distance to lovely historic town centre which had many events going on during July. Also within easy reach of supermarkets. We intended to stay foe one night to break our journey and ended up staying for a week. Very popular site for visit to Lemgo a short walk away. Very crowded even in low season and facilities OK but few & stretched. The whole site could do with a make over as now quite dated and no chemical disposal point. You have to pour waste down the motorhome point in the ground. A campsite, spilt in two areas, motorhomes on the front part. As the site is very close to the very lovely town centre we were looking forward to a few days visit. However, we were ushered into a very tight pitch area where our door virtually touched the awning of the van next to us! Too many vans were being packed onto the site. Several people were unhappy. The toilet/wash facilities were very clean. Due to the cramped conditions we left next morning. Vill du boka Campingpark Lemgo eller få mera information? Det går bra med nedanstående uppgifter. 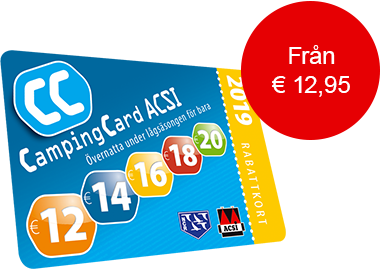 ACSI Eurocampings skickar din informationsförfrågan till "Campingpark Lemgo".